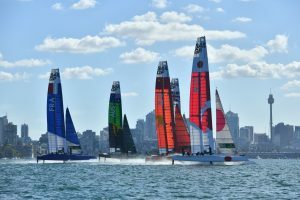 Annual global sports championship SailGP has stated that it used an ambitious remote production strategy for delivery of the world feed at its world premiere event in Sydney in February this year. The nature of the new sport, featuring supercharged F50 catamarans engineered for intense racing at electrifying speeds, meant that capturing the world’s fastest race boats and the athletes piloting them was going to be challenging, and required an innovative solution. In London at the centralised production facility, a team of 70 people worked across four control rooms to produce six feeds for television and OTT platforms. These were cut live and distributed in three languages: English, Japanese and Mandarin. Content was also supplied to the SailGP mobile application and used to support broadcast partners with specific and unique camera angles. SailGP has broadcast agreements in place that span 91 countries across five continents. The next event in the SailGP calendar takes place in San Francisco on 4 and 5 May. The annual championship then moves to New York in June and Cowes (UK) in August, before culminating in a $1 million winner-takes-all race in Marseille, France, in September. Established in 2018 and headquartered in London and San Francisco, SailGP is an annual, global sports championship featuring bold, cutting edge technology and awe-inspiring athleticism. The fan-centric, inshore racing takes place in some of the most iconic harbours around the globe and culminates with a $1 million winner-takes-all match race. 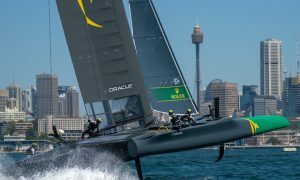 Rival national teams from Australia, China, France, Great Britain, Japan and the United States battle it out in identical supercharged F50 catamarans, engineered for intense racing at electrifying speeds exceeding 50 knots (nearly 60mph or 100kmph).